(Nanowerk News) Magnetic resonance tomography (MRT) images are an important diagnostic tool. The achievable contrast depends on how well the nuclear spins that form the basis of the imaging signals can be controlled. Mathematically, the properties of nuclear spins are described by special matrices. Now a team led by Professor Steffen Glaser at the Technische Universität München (TUM) developed an intuitive graphical representation of the information contained in these matrices for coupled spins in arbitrary quantum states (Scientific Reports, "Exploring the Physical Limits of Saturation Contrast in Magnetic Resonance Imaging"). 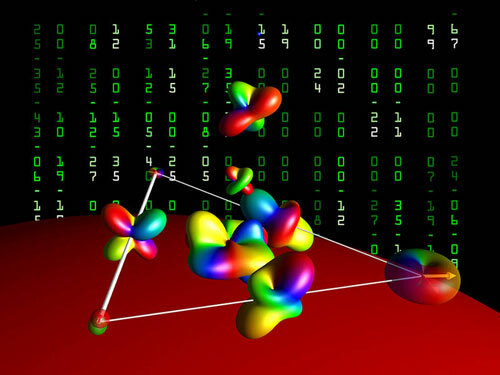 Atoms and their building blocks adhere to the laws of quantum physics, which frequently boggle the mind. In our everyday world, a tennis ball can be rotated about its own axis at any arbitrary speed. Nuclear spins, on the other hand, can rotate only at a single fixed speed, either left or right – their rotation is quantized. A working group led by Professor Steffen Glaser from the department of Chemistry at the TU München is developing mathematical procedures to control the behavior of nuclear spins in a targeted manner with maximum efficiency. With the developed methodology the group has already succeeded in determining the optimal contrast for MRT images. Using their insights, the development of imaging processes can now be advanced further. For future quantum computer technologies or technologies like nuclear magnetic resonance spectroscopy, one of the most important analytical tools in modern chemistry, a better understanding of the optimal control of coupled spins is essential. Here coupled spins can affect each other, leading to even more complex effects. For example, a phenomenon known as superposition exists in the quantum world. Transferred into our everyday world, this would mean that nuclear spins can rotate both right and left at the same time. The entanglement of quantum states is a further example. Einstein referred to this effect as “spooky action at a distance.” However, this “spookiness” bears great technical potential that ranges from precision measurements to secure data transmission. The quantum properties of coupled nuclear spins are described mathematically using so-called density matrices. “These are abstract columns of numbers that require very much experience to recognize the information contained within them,” says Steffen Glaser. Now Glaser has created a visualization tool that transforms these matrices into descriptive images. The so-called DROPS (discrete representation of operators for spin systems) process maps the density matrix onto three-dimensional drop like objects. They reflect all quantum mechanical interactions and entanglements between the spins at a given point in time. To illustrate the creation, deformation and rotation of spin-spin correlations under the influence of controllable magnetic fields in real time, Steffen Glaser, together with his son, developed an app for smart phones and tablet computers. “This program provides intuitive and comprehensible access to the fascinating world of quantum control theory for anyone dealing with the optimal control and utilization of quantum phenomena.” The SpinDrops app is available as a free download in the App Store for all iPad and iPhone users.